For me there is nothing more beautiful than the miracle of Mother Nature. Each season she puts on a show and when you consider all of the below came from a tiny seed, it really is incredible! I think this is why I enjoy gardening so much - seeing each plant evolve with the seasons. Here is Barbara Clematis -- named for Mr. Squash's sister. Well, I'm not sure it was specifically named for her, but we planted it in her honor. Barbara gave me the nicest compliment when they were here last year - she said if our garden was in the area where they have their yearly garden show that she would ask me to enter it! 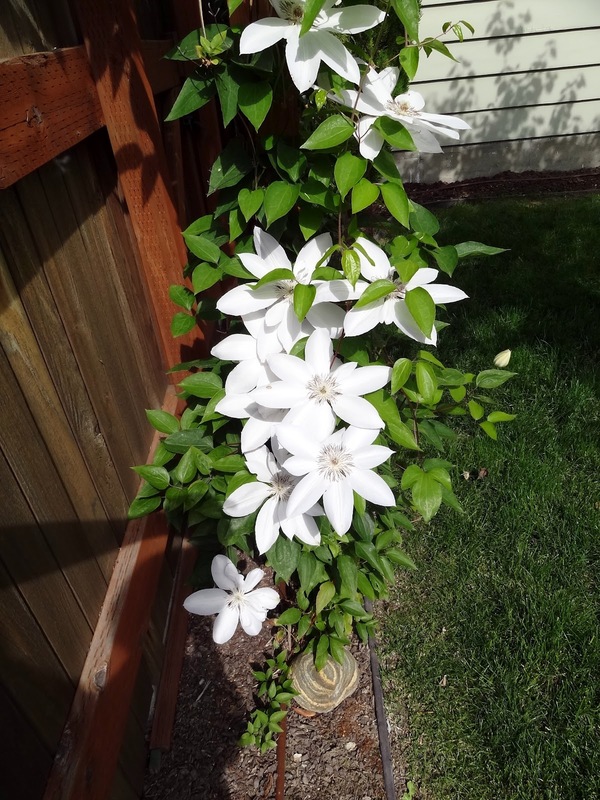 This is H. Bernard Clematis, which also happens to be the name of Mr. Squash's brother-in-law, married to Barbara! Actually, Bern doesn't have an H in front of his name, but that's OK. We planted this in his honor as well. He climbs clear up and over the trellis here and blooms the entire length! The flowers are nearly dinner plate size! See that cool rock underneath? Mr. Squash carried it a couple of miles back to the car when we were fishing "Rambo-style" one summer - and it is really heavy! We do love collecting unusual rocks on our fishing adventures. This late-blooming azalea was pining away in our front yard the first year. We moved it to the back in a more shady area and it now thrives. The specialty garden shop owner who delivered our espaliered pear tree recently was quite taken with this Geum - it measures about 3 feet around and was just a tiny plant when I put it in the ground last summer. Mr. Squash is doing his shuffle-hoeing behind the raised beds. 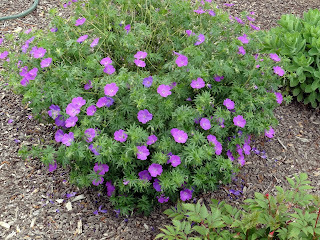 Check out the fluorescent Dianthus in the foreground! 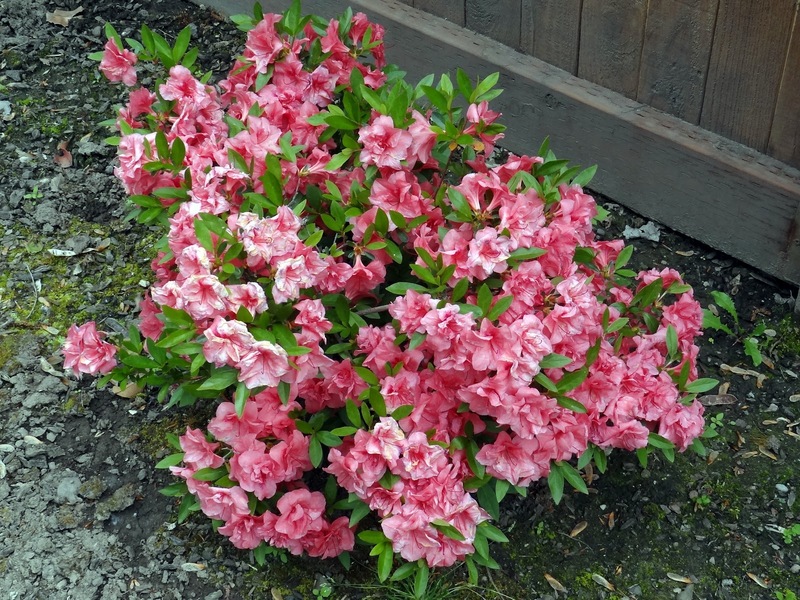 This Rhody was in sad shape last summer having survived a couple of moves and a terrible early freeze 2 years ago. With Mr. Squash's gentle care and lots of fertilizer look at it today! 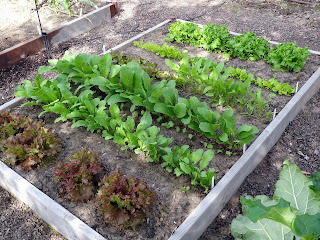 My lettuce and radish bed is going great guns! I'll be picking some this morning. 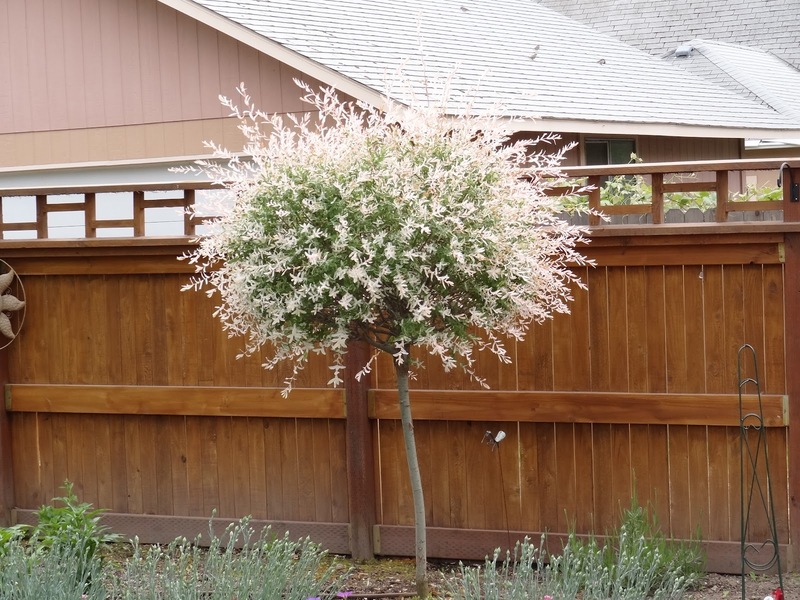 I just love our Japanese Hakuro Nishiki Willow we planted last summer. It's difficult to see in this light, but the lighter parts of the branches are green and pink variegated! Sadly I'll need to trim it back into a ball in a day or two or it will quickly get out of control. Below are some incredible carnations just getting ready to burst with bloom. The other day Mr. 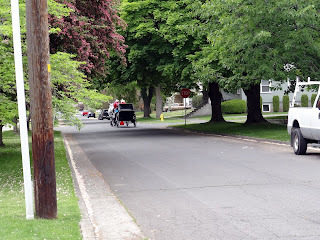 Squash called out that there was a horse and carriage coming down the street! By the time I got out there with my camera, all I could see was the tail end! If you click on the photo you can just see the white horse! These folks give rides around town, but it's the first time we've seen them come down our street! In case you're wondering, I AM sewing, just nothing I can show you right now! The flowers are gorgeous! You and Mr. Squash should be rightfully proud of all your hard work and nurturing. A gardener I'll never be! Your garden looks so great. Look at all your lettuce. My Clematis vine died this year so it is time to get a new one. 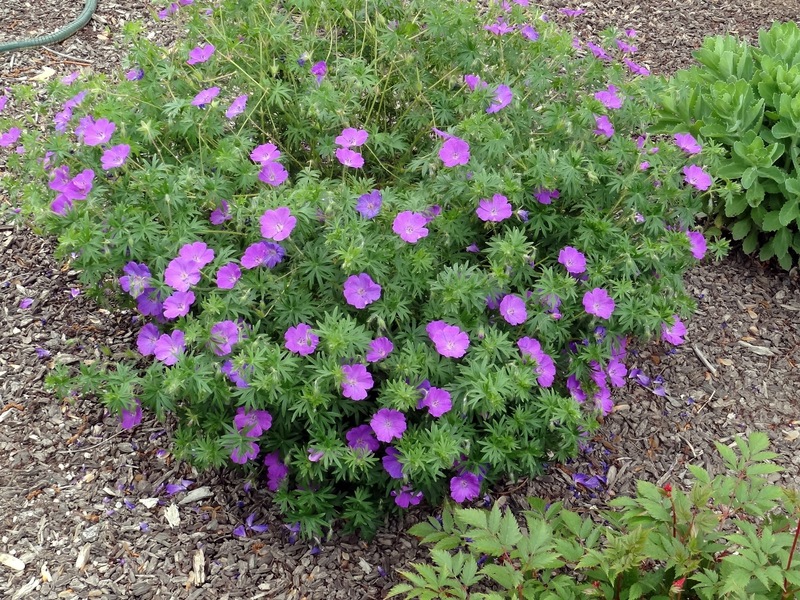 I plant it where it will climb up onto my porch. I really like that willow tree. Very pretty. Such a pretty yard. Our rhoddy never does well and part of our clematis died this year. Mr. Creations has a very green thumb too! 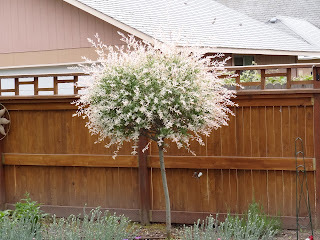 Last year he dug out our Japanese willow as it started to take over the planting bed in the front yard. Do you share your bounty with the bunnies? They look so tasty. You definitely have a longer growing season than we do. We're just starting to get blossoms on plants. It's the one thing I miss about California. Such a beautiful, I feel like I have been on a garden tour. Thank you for sharing such beauty. 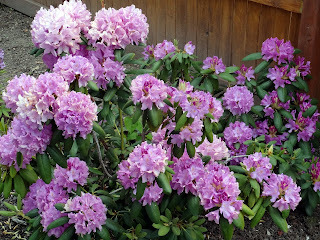 Such beautiful flowers - thanks for sharing! You have such a beautiful garden! It is too early for us to plant tomatoes or summer flowers yet, and our white and purple Clematis both died last winter. But the apple trees are covered in flowers now! Your blooms are fantastic, Candace! Gardening is indeed very rewarding and gives us so much Joy! 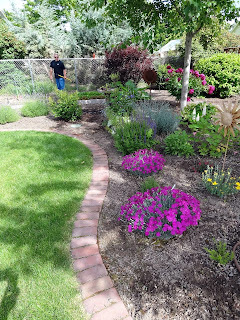 Thank you for sharing these beautiful pictures of your garden! Beautiful flowers...I am so waiting for mine to start to bloom! Your yard and gardens are looking spectacular, Candace...and Mr. Squash. How inspirational! Just yesterday we planted two new clematis and one is a fall bloomer. 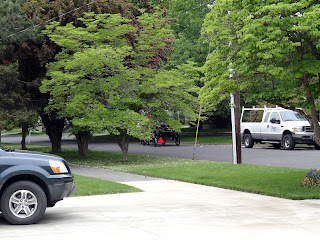 Keep them photos coming because I love seeing pictures of your yard. Your garden looks more like a stroll in a park! Just gorgeous. 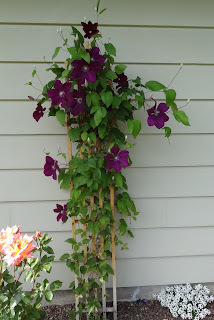 I love clematis, I have 3 of them! Yours are beautiful, as is the rest of your garden. Thank you so much for sharing! I love that your bushes are named after family members!! Your garden looks beautiful. I love seeing all the color.